The Scene Before Gibraltar On the Morning of the 14th of September 1782, after James Jefferys, 1789, collection unknown. Much as I would love to use the original piece by James Jeffereys, which is in the collection of the Government Art Collection, it appears to be protected under copyright. Being unfamiliar with British copyright law, and unwilling to breach it, I instead turn to this colored reproduction of the original painting. The actual collection to which it belongs is unknown to me. If you have any further information, please let me know! 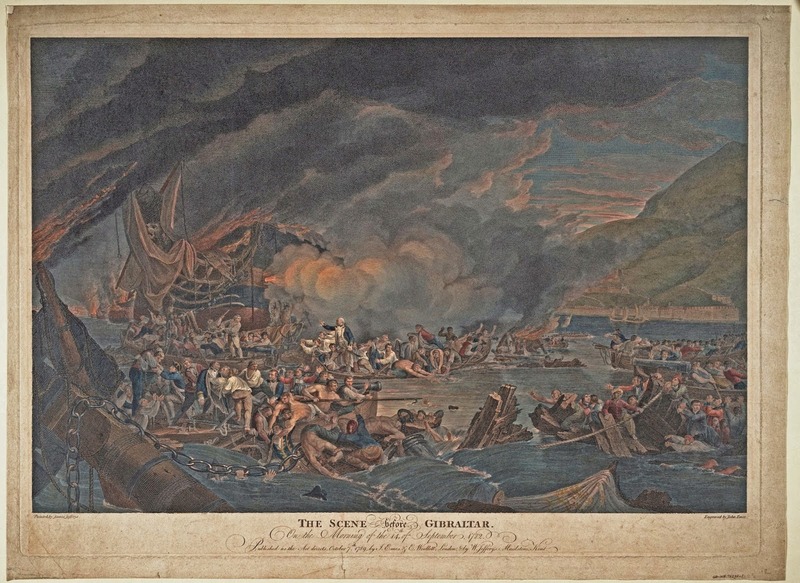 This print, and the painting from which it was drawn, is drawn from the aftermath of the great British victory at the Great Siege of Gibraltar. The Spanish and French had blockaded and bombarded the key British post on the gateway to the Mediterranean with the use of floating batteries. You can see one firing away in the background of this piece. The British garrison, composed of regular soldiers and Royal Navy sailors, stormed the floating batteries, ending the siege. What makes this piece, and others like it, fascinating is the fact that it does not depict the storming of the batteries, but rather the rescue operation the British conducted in its wake. Begging French and Spanish sailors, with a few North Africans mixed in, are pulled from the sea by their merciful enemies. There's a huge mix of sailors in here, and it is often difficult to tell which are intended to be British and which are meant to be French, Spanish, or North African. Still, I'll try my best to pick them out! 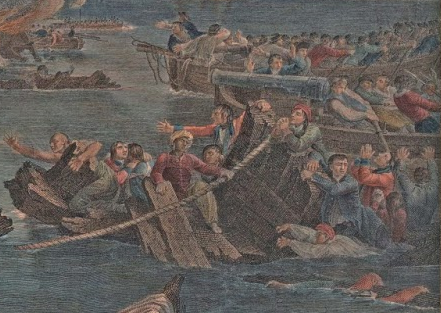 These sailors, clutching the wreckage, are clearly intended to be the vanquished enemies. In the center is a North African wearing a turban, and he is surrounded by French or Spanish officers and sailors. A couple of them wear caps, other are in blue jackets with slash cuffs, and a few more are in red uniforms with blue facings. These sailors are British. Standing and directing the rescue effort, with his sword sheathed, is the British governor General George Augustus Eliott. Surrounding him are sailors without their waistcoats, and even some without shirts. In the center of the vessel we see a pair of them stripping their jackets, perhaps to allow them to better reach into the sea and rescue the drowning men. One of them wears a pair of plain canvas trousers, while another (reaching with both hands into the sea and shirtless) is wearing what appear to be blue trousers. Though there is a bow gun on this vessel, it is not charged, nor do the sailors seem the least interested in firing it. Using boat hooks and oars, they navigate the wreckage in the search for more survivors. Most are shirtless, though a couple are wearing jackets: two or three in red, one in blue. The sailor at the bow wears a tight fitting pair of trousers, and a couple of the sailors look to be wearing round hats with short brims. Officers and sailors are dragged from the ocean and wreckage by burly, shirtless British tars. Tow of them wear blue breeches and another wears plain trousers. Though many are without waistcoats, one of them is wearing a red jacket and a white neckcloth.